Hurricane Florence is impacting thousands in the Carolinas and many people across the country are finding ways to help. A Gibson County woman is being recognized across the country for her heroic act during Hurricane Florence. 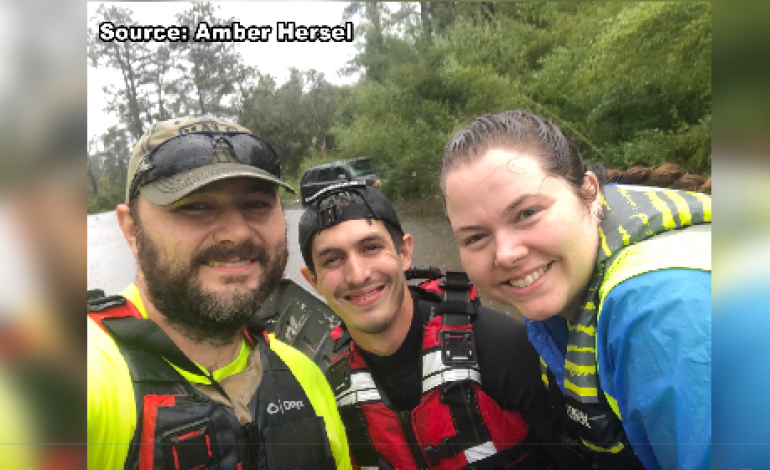 Amber Hersel, Civilian Crisis Response Team volunteer, is being nationally recognized for a moment captured between her and 7-year-old Keiyana in James City, North Carolina. The two photos were taken by Chip Somodevilla, Getty Image photographer. “That moment I was like you know what, this is where I’m supposed to be because families like this, this is why we do this,” says Hersel. The Fort Branch native packed up Thursday morning to help those facing Hurricane Florence. The Civilian Crisis Response Team, based out of Central Indiana, have made roughly 56 water rescues. Hersel says the photo captured one of her first rescues. As a mom of a 7-year-old daughter, she says she would want other people to do the same. “We’re one people and when we’re in a time of need we should all pull together and help each other,” says Hersel. The Civilian Crisis Response Team says they plan on staying in North Carolina as long as they’re needed. The link to their organization can be found here. 44News is also teaming up with the American Red Cross to host a telethon this Wednesday from 6 a.m. to 6:30 p.m.